For its third year, the Arizona Underground Film Festival is really gonna blow it up. Although the fest started as a modest three-night affair back in 2008, in 2010, the festival will now run for a full eight days, Sept. 18-25, and will have screenings at multiple locations in Tucson. AUFF is the most rapidly rising young fest on the underground circuit. So, you better get your film in if you want in on the action. The festival is looking to screen 75 films this year, both features and shorts. And they’re looking for films in the following categories: Narrative, Horror, Documentary, Experimental, Animation and Exploitation. To get a feel for what types of underground films the fest is into, please check out last year’s lineup. 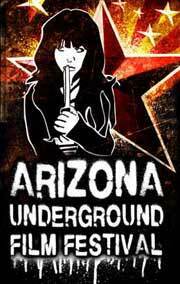 To submit, you can either visit the Arizona Underground Film Festival‘s submission page or go through Withoutabox.